Hostels in China: Top 9 reasons to stay there. Hostels in China are good and in our opinion often better than hotels. Below you can find the best reasons to take a Chinese hostel instead of a hotel in China. Of course: hostels are cheap! The cheapest option is always to book a bed in a dorm, in that you sleep with other people in one room. More convenient is a private room, often available for 1-4 persons and most of the time very comfortable! Most staff in hostels do speak English in China. This is very useful if you don’t speak the Chinese language nor can read it. Staff of average hotels in China do not speak English, we visited several times four-star hotels (****) but the staff didn’t speak English at all. Almost every hostel offers trips for reasonable prices, or help with booking train/bus tickets. Especially booking train and bus tickets isn’t that easy in China since ticket offices do only speak Chinese. Not all travel agencies, for example in Beijing with trips to the Great Wall, are trustable. Hostels are in that case a good solution to buy your trip to the Great Wall. 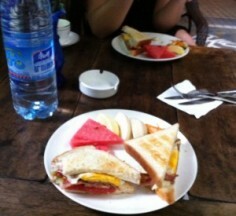 Most hostels in China do offer a western breakfast: toast with bacon and egg + coffee or tea. This sounds a bit unnecessary to backpackers, but believe me, after a few weeks of Chinese breakfasts (rice, noodles etc.) you would love to have a sandwich or a Western breakfast! One of the most well-known reasons to stay in a hostel is meeting other travelers. When you stay in a dorm you will meet for other backpackers and maybe travel together for a few days. If you are searching for anyone who wants to make a trip together, for example hiking in the mountains, tell the reception staff what you want to do. Sometimes they hear more people with the some story and they create a “connection”. Most hostels in China are cozy and convenient to stay, the atmosphere is good and people are happy! The atmosphere is much better in compare to most hotels. Although most accommodations provide a internet connection today, all hostels do for free! Just ask for the password at the reception. Hostels are most of the time good located near the city center or near a great scenic spot. Even some hostels in China are located in a national park, for example in the park were the Avatar movie was recorded: ZhangJiaJie National Park. It sounds a bit weird, but not every hotel in China is allowed to welcome foreigners. Last year (April 2014) we ordered a room in a Chinese hotel in Wulong at a German website. Unfortunately we received an e-mail that we couldn’t stay in the hotel since foreigners were no longer allowed to visit the hostel because of a Chinese law. As far as we know, all hostels are allowed to welcome foreigners.